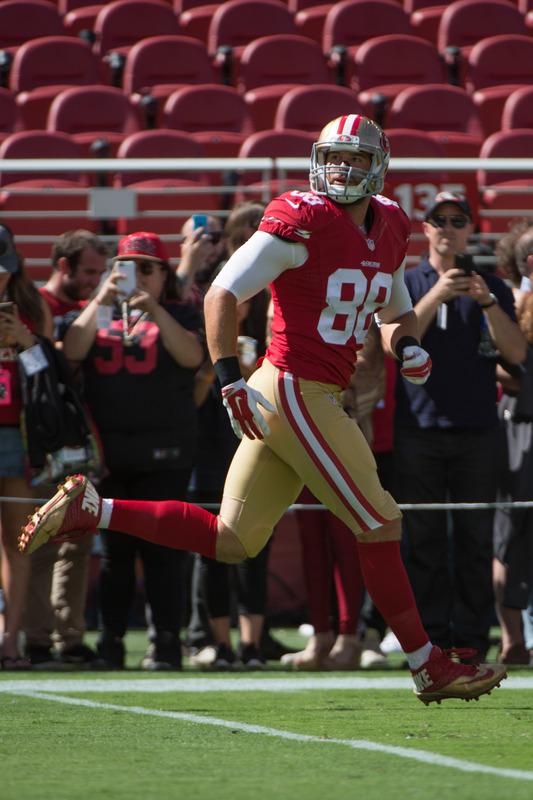 FEBRUARY 23: The 49ers have finalized a four-year extension for Celek, locking him up through the 2019 season, the team confirmed today in a press release. Per Ian Rapoport of NFL.com (via Twitter), the four-year pact is worth $14MM, with nearly $5MM in guaranteed money. FEBRUARY 17: The 49ers and tight end Garrett Celek are close to finalizing a long-term deal, a source tells Adam Caplan of ESPN.com (on Twitter). Celek was slated to hit free agency in early March. Celek, 27, played in 11 games last year (eight starts) and hauled in 19 catches for 186 yards and three touchdowns. Celek played 39% of the 49ers’ offensive snaps and 19% of their special teams plays before suffering a high-ankle sprain late in the season. That injury caused him to miss the final five games of the year but he’ll be 100% when training camp gets underway. Celek is the younger brother of Eagles tight end Brent Celek. Interestingly, Chip Kelly is now going from coaching one member of the Celek family to another. Garrett Celek‘s season, and possibly his time with the 49ers, has come to an early end, with the team announcing today that it has placed him on injured reserve, ending his season. Taking Celek’s place on the 53-man roster is Shayne Skov, who was cut just three days ago and has now re-signed a new two-year contract with the Niners. Celek, 27, established new career-highs across the board this season before he was sidelined by an ankle injury. The former undrafted free agent caught 19 balls for 186 yards and three touchdowns after not being a major part of the 49ers’ offense during his first three years with the team. Having now played four seasons, Celek will be eligible for unrestricted free agency this winter, and could draw some interest from clubs besides the Niners after his solid showing in 2015. As for Skov, he typically doesn’t see the field much for San Francisco, contributing almost exclusively on special teams. Barring injuries, he’ll likely continue in that role for the last few weeks of the 2015 season. Still, the results of Gronkowski’s MRI aren’t in yet, so the Patriots won’t breathe easy until they get confirmation of their initial diagnosis. For now though, it looks like the club may have avoided a worst-case scenario for the star tight end, since his reaction to the hit on his knee had most of us expecting a season-ending injury. Let’s round up a few more injury updates from across the NFL…. The Bills didn’t get good news on defensive end Alex Carrington, who tore his quad tendon and is undergoing season-ending surgery today, according to Rapoport (Twitter link). It’s the latest blow to a Buffalo defensive line that was already missing Kyle Williams – who is out for the year – and Mario Williams on Sunday. Rapoport also provides an update on Ben Roethlisberger, tweeting that, while the Steelers quarterback placed himself in the concussion protocol, he may not have suffered a concussion on Sunday, and could be cleared for Week 13. 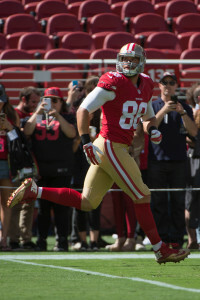 49ers tight end Garrett Celek is out indefinitely due to a high ankle sprain, writes Matt Maiocco of CSNBayArea.com. Celek, who has caught 19 balls for the team this year, went down with the injury in the first quarter of Sunday’s game against the Cardinals. THURSDAY, 2:48pm: The 49ers have officially confirmed their new deal with Gabbert, along with the previously reported re-signing of tight end Garrett Celek. TUESDAY, 10:19pm: It’s a two-year, $2MM deal for Gabbert, per Chris Mortensen of ESPN (Twitter link). Gabbert, a former 10th overall pick, served as Colin Kaepernick‘s primary backup last season, though he only saw the field in mop-up duty, since Kaepernick stayed healthy all year. The two signal-callers are currently the only two QBs on San Francisco’s roster, so it looks like the former Jaguar will have the inside track on the No. 2 job for 2015, though there could be another move coming for the Niners. While we haven’t yet seen what Gabbert could do away from Jacksonville, his track record suggests that the 49ers would be in trouble if he saw any extended action in 2015. For his career, the 25-year-old has completed 53.2% of his passes and thrown more interceptions than touchdowns, en route to a 5-22 record as a starter. The NFC West brought multiple headline-worthy news items Friday – the Seahawks’ extension of Marshawn Lynch and a possible contract restructuring for the Cardinals‘ Carson Palmer, for instance – but not every transaction includes household names. The Seahawks’ and Cardinals’ division rivals, the 49ers and Rams, proved as much Friday. The 49ers signed long snapper Kyle Nelson to a four-year extension, according to ESPN’s Adam Caplan. Last season was Nelson’s first 16-game campaign. He has been a member of seven different organizations and has had three separate stints with the 49ers since entering the NFL in 2011. San Francisco also agreed to a one-year deal with tight end Garrett Celek, per Caplan. Celek has been a backup to Vernon Davis, having caught just eight passes in three seasons. Jim Thomas of the St. Louis Post-Dispatch tweeted that the Rams tendered offers to two exclusive rights free agents, running back Chase Reynolds and offensive lineman Brandon Washington. As ERFAs with fewer than three years’ experience, the tender means that both players must either stay with the Rams or not play at all. Reynolds has made his hay in St. Louis as a special teamer, while Washington has appeared in just one game since his career began in 2012. The 49ers have made a change to their 53-man roster, signing running back Phillip Tanner and placing tight end Garrett Celek on the injured reserve list to make room for Tanner, the team announced today in a press release. Tanner recorded 149 rushing yards and two touchdowns on 56 carries during three years with the Cowboys, along with 93 receiving yards on nine catches. The Middle Tennessee State product, who also contributed on special teams in 2013, spent time with the Colts and Cowboys this summer, but was ultimately waived by Dallas during roster cutdowns at the end of the preseason. Tanner caught on with the Bills for about a month when Buffalo’s backfield was decimated by injuries, but didn’t get any touches during his stint with the club. In San Francisco, the 26-year-old will provide depth in the backfield, with Frank Gore and Carlos Hyde both ailing, and could get an opportunity to play on special teams as well, with Kassim Osgood done for the year. Celek, who spent most of the year on San Francisco’s PUP list, appeared in three games, and caught two balls for 53 yards. He’ll be eligible for restricted free agency this offseason. With tonight’s crucial divisional showdown against the Seahawks looming, the 49ers have made multiple changes to their 53-man roster, the team announced today in a press release. Tight end Garrett Celek has been activated from the physically unable to perform list, while tight end Asante Cleveland has been promoted to the active roster. To accommodate the additions, the club has waived linebacker Chase Thomas and placed tight end Derek Carrier on the injured reserve list. Multiple injuries at the tight end position necessitated the Niners’ latest additions — besides Carrier, who had been sidelined with a foot injury and will now miss the rest of the season, tight end Vance McDonald is also banged up, dealing with a back ailment. Having been on the PUP list since August, it’s the first time Celek has been on the active roster this season, and the second game for Cleveland, who was briefly promoted in September before returning to the taxi squad. As for Thomas, the 25-year-old was signed off the practice squad earlier this month and saw action in the Niners’ last three games. He looks like a candidate to return to the practice squad, assuming he clears waivers.